Dietitians can use visual aids, among other materials, to ensure more effective communication. Every day dietitians and other health professionals communicate nutrition information to patients, clients, and the general public through one-on-one counseling sessions, workshops, brochures, handouts, Web sites, magazines, and other media forms. However, according to the Institute of Medicine’s 2004 report “Health Literacy: A Prescription to End Confusion,” more than 300 studies show that most health information is not understood by the people for whom it was intended. A growing body of evidence is linking limited health literacy to poor health knowledge, behaviors, and outcomes. Addressing health literacy is increasingly seen as a way to improve preventive care and reduce health disparities. Health literacy is defined as “the degree to which individuals have the capacity to obtain, process, and understand basic health information needed to make appropriate health decisions and services needed to prevent or treat illness.”1 This capacity includes basic literacy and numeracy skills and the ability to access health information, communicate with healthcare providers, and navigate the healthcare system. Health literacy was assessed nationally for the first time in 2003 as part of the National Assessment of Adult Literacy. Fourteen percent of U.S. adults were found to have below basic health literacy skills while 22% had only basic health literacy skills. Limited health literacy is particularly prevalent among older adults, people with limited income, minority populations, and people with limited English proficiency. However, adults with a high level of education can also have limited health literacy. Health literacy is strongly linked to literacy, defined by the National Literacy Act of 1991 as “an individual’s ability to read, write, and speak in English, and compute and solve problems at levels of proficiency necessary to function on the job and in society, to achieve one’s goals, and develop one’s knowledge and potential.” According to the National Adult Literacy Survey from 1993, about one quarter of adults in the United States may lack the literacy skills needed to function adequately in modern society. Understanding nutrition information often requires understanding complex scientific concepts. This is an example of how a patient with limited health literacy might perceive nutrition information: Elytsefil snoitacifidom can help you eganam your noisnetrepyh. If you are thgiewrevo, a noitcuder in weight is dednemmocer. This can be dehsilpmocca through raluger lacisyhp ytivitca and noitpmusnoc of a diet rich in fruits and vegetables and low in total and detarutas fat. Research shows that up to 80% of patients forget what their physician tells them as soon as they leave the office.2 Patients with limited literacy have trouble interpreting nutrition information, identifying normal ranges for blood sugars and blood pressure, interpreting their own numbers, and acting on the information. Given the prevalence of nutrition-related chronic diseases and the necessity of patients to be empowered to manage their own healthcare, dietitians must take action to address limited health literacy. How do you know when patients have limited health literacy? Various assessment tools have been developed to assess patient health literacy. The most common assessment tools include the Rapid Assessment of Adult Literacy in Medicine and the Test of Functional Health Literacy in Adults. The Newest Vital Sign is an assessment tool that uses a nutrition label from an ice cream container. Patients are asked six questions to assess how they interpret and would act on the information provided on the label. These assessment tools are available online in English and Spanish. Because of the stigma attached to illiteracy, the majority of patients with poor literacy skills hide the fact that they cannot read the written information given to them. Dietitians should look for red flags, including statements such as “I forgot my glasses” or “I’ll read this when I get home” or difficulty explaining medical concerns. Poor readers often lift texts closer to their eyes or point to a text with a finger while reading. Their eyes may wander on the page without finding a central focus. Bridgette Collado, MA, RD, a health and nutrition communication consultant, says the ability to understand health information depends on many factors, not just education or reading level. “Numeracy, computer literacy, and visual, hearing, and cognitive impairments also have a role in health literacy,” she says. Collado screens clients for such abilities and disabilities during education sessions to assess their health literacy skills. Given the difficulties of assessing patient health literacy, it is prudent for dietitians to take steps to promote and confirm understanding of the information they teach to all of their patients. Victoria Hawk, MPH, RD, a researcher at the University of North Carolina (UNC) at Chapel Hill, recommends that instead of seeking to identify people with limited health literacy, dietitians should take the universal precautions approach that assumes all patients have difficulty understanding nutrition information. According to Hawk, the Health Literacy Universal Precautions Toolkit has been developed by UNC for the Agency for Healthcare Research and Quality and is available at no cost at www.nchealthliteracy.org. Andrulis and Brach recommend that health literacy be viewed from the context of language and culture.3 Almost one half of patients with limited health literacy are members of racial and ethnic minority groups. Additionally, adults with low English proficiency may also have limited health literacy in their native language. Dietitians should be mindful of the health literacy level of patients from different cultural and linguistic backgrounds and use written nutrition information that is easy to read, culturally relevant, and translated into the native language of patients with limited English proficiency. Several Web sites provide translated nutrition information, including http://medlineplus.gov and www.healthtranslations.com. Individuals with limited health literacy cross all ethnic and class boundaries; however, they share common characteristics when it comes to processing information, including the tendency to think in concrete and immediate rather than abstract and futuristic terms, to interpret information literally, and to have difficulty processing information, such as when reading a menu or following medical instructions. Whether working in a hospital, senior center, or private practice, all dietitians can employ the following strategies to enhance patient or client understanding of nutrition information and improve adherence to dietary recommendations. • Limit the number of concepts you teach at one time. Less is more if patients understand the information. • Use simple, jargon-free language and define technical terms. According to Health Literacy From A to Z: Practical Ways to Communicate Your Health Message by Helen Osborne, MEd, OTR/L, patients often do not understand jargon. For example, in healthcare, “unremarkable” generally means you’re fine, while “positive” means you’re not. • Organize information so that the most important messages stand out. Repeat these vital messages. • Ask patients to “teach back” what you just taught. For example, ask, “I want to be sure that I did a good job explaining an appropriate diet for high blood pressure because it can be confusing. Can you tell me which foods are high in salt?” If the patient does not repeat the information correctly, rephrase it rather than simply repeating it. • Use demonstrations and hands-on activities. Practice reading food labels with patients and clients and demonstrate portion sizes using food models. Repetition of skills helps build confidence and improve recall. Assess readability using online assessment tools or word processing software. • Use visuals. Including pictures in health education materials can increase attention to, comprehension of, and recall of health information, as well as adherence to health recommendations.4 For example, LearningAboutDiabetes.org offers free, low-literacy print materials on diabetes care with attractive, informative visuals. • Think beyond the brochure. Nutrition education in audio or video formats, interactive computer programs, games, and other multimedia can strengthen patient understanding of nutrition information. MyPyramid.gov offers a variety of interactive tools and multimedia to educate consumers about MyPyramid. • Refer patients with Internet access to reliable consumer health Web sites. Eighty percent of adult Internet users search for health information, explains Robin Sabo, MLS, MS, RD, a librarian at Central Michigan University, but many Web sites with nutrition information are inaccurate. Guide patients to consumer health Web sites that offer up-to-date, trustworthy information, such as http://medlineplus.gov, www.healthfinder.gov, and http://navigator.tufts.edu. • Keep written education materials at or below a seventh-grade reading level. A helpful resource, the University of Michigan Health Sciences Libraries, provides an online plain language medical dictionary at www.lib.umich.edu/health-sciences-libraries/plain-language-medical-dictionary. The National Institutes of Health also provides plain language resources and training at http://plainlanguage.nih.gov. • Know your audience. Review existing data and, if possible, gather new data about the demographics and nutrition knowledge, attitudes, and behaviors of your target audience. The Institute of Medicine report “Health Literacy: A Prescription to End Confusion” recommends engaging patients and other members of the target audience in the development of health communication materials. • Use the active voice. Make recommendations using action verbs. • Include pictures and other visuals to support verbal and written information. Use visuals that directly relate to the information. Circles and arrows are helpful to point out key information. In her book, Osborne recommends applying the universal design concept—or the design of products and environments that are usable by all people to the greatest extent possible—to the creation of print and Web-based health communications. Most people appreciate and find easy-to-read brochures and easy-to-use Web sites helpful. For more information about how to develop clear and simple print materials for low-literate readers, review the National Cancer Institute’s guidelines at www.cancer.gov/aboutnci/oc/clear-and-simple. 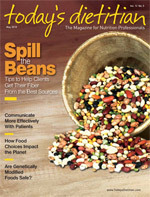 Dietitians play an integral role in teaching individuals the skills they need to prevent and manage chronic diseases. In addition to employing the strategies described in the article, dietitians should convey respect, compassion, and sensitivity to all patients and clients to empower them to participate in their own healthcare. — Melissa Ip, MA, RD, is a health educator in New York City. She would like to thank Elena Carbone, DrPH, RD, LDN, an associate professor of nutrition at the University of Massachusetts, for her contributions to this article. 1. Ratzan SC, Parker RM. Introduction. In: National Library of Medicine Current Bibliographies in Medicine: Health Literacy. Selden C, Zorn M, Ratzan SC, Parker RM (eds). Pub. No. CBM 2000-1. Bethesda, Md. : National Institutes of Health; 2000. 2. Kessels RP. Patients’ memory for medical information. J R Soc Med. 2003;96(5):219-222. 3. Andrulis DP, Brach CR. Integrating literacy, culture, and language to improve health care quality for diverse populations. Am J Health Behav. 2007;31 Suppl 1:S122-133. 4. Houts PS, Doak CC, Doak LG, Loscalzo MJ. The role of pictures in improving health communication: A review of research on attention, comprehension, recall, and adherence. Patient Educ Couns. 2006;61(2):173-190. 5. Nutbeam D. Health literacy as a public health goal: A challenge for contemporary health education and communication strategies into the 21st century. Health Promot Int. 2000;15(3):259-267.